The Cape Cod Sea Camps in Brewster celebrated the 20th Year of their annual “Leadership Weekend” April 29 – May 1, 2016. The weekend is for group leaders looking to plan a trip to Cape Cod and was very well attended with over thirty five participants from thirteen different school districts. The leaders were from both current groups travelling this season to Cape Cod and prospective groups looking to plan a trip. Attendees came from schools in Massachusetts, Connecticut, Vermont and traveling from as far as Albany, NY. The three day weekend event held the last weekend in April was planned to give leaders and staff some “on Cape time” prior to their visit to Cape Cod, to network with other like-minded educators, and give them ideas about program and curriculum for their trip. 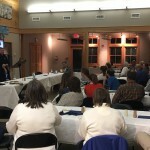 Events included meals and accommodations provided by the Cape Cod Sea Camps seasonal “Group Business” and curriculum and guest speakers from the Cape Cod National Seashore, Wellfleet Audubon, Provincetown Coastal Studies and Expedition Whydah the Pirate Museum. Guest lecturers the first evening included Scott Landry, Director of the Marine Animal Entanglement Response Team at the Provincetown Center for Coastal Studies and Owen Nichols, Fisheries Research Director, Provincetown Center for Coastal Studies who spoke about entanglement issues and how they affect our local wildlife. 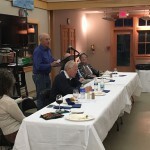 Turtles, whales, dolphins and sharks were all the hot topic of the evening and the research that Provincetown Coastal Studies have gathered in the Cape Cod area including an update on Right Whales in Cape Cod Bay. Barbara Dougan, Education Specialist at the Cape Cod National Seashore hosted the group Saturday morning with a program that began in the North Pamet area of Truro. The group climbed Bearberry Hill, which is a hidden secret even to Cape Codders in the famous dunes of Truro and one of the best places for a spectacular overview of where the Atlantic Ocean has broken through the dunes in addition to spotting whales and seals in the Atlantic Ocean. The group was then onto First Encounter Beach in Eastham on Cape Cod Bay after a short stop at the Cape Cod National Seashore Visitor Center. Scott Tinti, Cape Cod Sea Camps Naturalist and Historian Emeritus, has taught history to middle school students for decades and offered some insights and program ideas about where we are exactly in reference to the arrival of the Mayflower in Provincetown Harbor in 1620 and America celebrating its’ 400th birthday in 2020. Saturday night was the main event and catered dinner provided by Cape Cod Sea Camps for guests. It has been 20 years that the “Leadership Weekend” has hosted teachers and more than 40 years since the Cape Cod Sea Camps has hosted their first school groups in Brewster for educational trips. Henri Rauschenbach, Cape Cod Sea Camps Alumni Director and founder of the Cape Cod Sea Camps Group Business was the MC for this 20th Anniversary Dinner Celebration. Special guests for this dinner included Bob Prescott, Director of Wellfleet Bay Wildlife Sanctuary, Stormy Mayo of Provincetown Center for Coastal Studies, Barbara Waters of the Cape Cod Cooperative Extension and guest speaker Chris Macort who is the lead archalelogical diver for Expedition Whydah; the pirate ship which sank off Wellfleet in April of 1717 and was rediscovered in the 1980’s.